The SING! Challenge ….. What a fantastic afternoon! Enjoyed by so many, from those aged 10 to 101! And everyone in between. All over the UK, in conjunction with Comic Relief, people in care homes across the UK joined together to sing ‘Sing’ by the Carpenters. The Middleton Hall choir did us proud, not only with a rousing rendition of ‘Sing’ but many other favourites that we could all sing along to. We were delighted to be joined by schoolchildren from St George’s C 0f E Academy. They learnt the song and came to add a special energy to the proceedings. What a brilliant team! Many residents came to enjoy the fun. The red nosed biscuits were a treat and all in all, it was a great afternoon. Over £38 was raised for Comic Relief too. Thank to our choir and St George’s Academy for their hard work and smiles. This entry was posted in News on March 31, 2017 by admin. Residents and friends gathered for a hugely enjoyable Race Night. Not only did we raise the roof with cheering our horses on but we raised money for the Mayor’s charities too. Not everyone had been to a Race Night before, but it wasn’t long before we all got the hang of it. The evening began with a hearty, Irish themed supper and then the racing began in earnest. Compere Ian added professional know how to the event and soon we were all putting our money where our mouths were, betting on horses and even buying ownership of the horses we liked the sound of. The first race was named The Chain Gang Classic, after the enthusiastic party of mayors and their partners who attended in support of the occasion. The other races, such as the Rose of Waterside Cup, Middleton Magic Stakes and Into the Woods Spirit Cup were equally popular. The takings for each race were split 50/50 with half going to the Mayor’s Charities. The other half was divided amongst those who bet on the winning horse. Additional prizes were presented to the winning horse owners. Thank you to everyone who supported the event. In response to the very positive feedback …. yes, we will have another similar event in the future! This entry was posted in News on March 20, 2017 by admin. What an honour to be one of only four finalists in the Skills for Care Accolades Awards! Middleton Hall was shortlisted in the category of Best Employer (51-249 employees) and we travelled to the Titanic Hotel in Liverpool for a Gala Dinner to celebrate the awards. We didn’t win but the event was a memorable experience and highlighted ways in which we can continue on our journey to achieve excellence. We were delighted that Andrea Sutcliffe, Chief Inspector of Social Care at the CQC (pictured here, right, lower row) made a point of making contact to congratulate Middleton Hall on its Outstanding CQC rating. As well as being an occasion to recognise high achievers, it was without doubt also a celebration. TV celebrity Samia Ghadie was an entertaining host for the evening and a live band provided the music for a spot of dancing. All in all it was a great night, and one that only make us more determined to continue with our progress and return in 2018. Middleton Hall is proud to announce that we have been rated as outstanding following an unannounced 3 day inspection by the CQC in January this year. Under CQC’s programme of inspections, all adult social care services are assessed and given a rating according to whether they are safe, effective, caring, responsive and well-led. Middleton Hall was not only rated outstanding overall but the CQC found us to be outstanding in all five domains. This is a rare achievement as only three other organisations inspected in the whole of the North have demonstrated this level of service, an achievement Debby Lamont, Registered Manager and Head of Care and Quality is extremely proud of. “I am delighted that the dedication and commitment by all our staff across the whole retirement village has been recognised. Everybody has a major part to play in the person centred service we provide. We continually strive for excellence and continuous improvement at Middleton Hall. This is embedded into our culture and value system. I am so pleased the CQC inspectors could see how we work with residents so that they really live life to the full. Without exception, every single member of staff genuinely cares about residents, each other and our wider community. 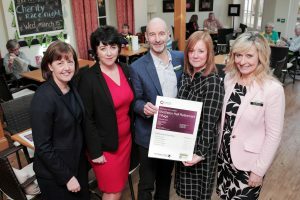 Debbie Westhead, CQC’s Deputy Chief Inspector for Adult Social Care in the North joined Jeremy, Lesley, Pam, Debby and all the staff and residents on the day the report was published to celebrate this high accolade. “Without exception, people using the service and their families, told us they were extremely happy with the level of care received and we saw highly motivated staff that were very satisfied with the work that they were doing. The culture at Middleton Hall was also very impressive. It was caring, open and transparent. Staff worked closely and effectively with other healthcare partners and really took people’s views on board and acted on feedback”. “This unique service, which catered to people’s changing needs is truly setting an example, and I hope other care providers look to them to see what outstanding care looks like. The whole team should be very proud of the service they are providing. Jeremy Walford, Managing Director of Middleton Hall commented, “The CQC inspects almost 25,000 services including hospitals, GP Practices, dental services as well as care homes and I believe only one other care home in the North has achieved outstanding in all five domains. Middleton Hall has always strived for improvement – our vision has always been about being the best. I am obviously delighted that the CQC agrees that we are outstanding. What is particularly significant is that the report covers every part of Middleton Hall – all our team contributes to our achievement of being an “Outstanding” and indeed we are fortunate to have such an outstanding team working at the retirement village. A resident struck …. not gold, but copper at the recent Estates workshop. The group was using a metal detector to explore the Middleton Hall grounds in an entirely new way. The find was a ‘Cartwheel Coin’ – a two pence coin, unusually made from solid copper and presenting the head of George III. Quick research shows these coins to have been minted only in the year 1797. The coin may be a link to New South Wales in Australia, to where 18,000 of these coins were exported, and/or to the military. The year pre-dates the first known history of Middleton Hall being built on the land in 1820. Other ‘treasure’ included small aluminium parts thought to have possibly come from an aeroplane which crashed onto the Middleton Hall site in WW2. All in all, it was a very interesting morning. This entry was posted in Estates, Life At Middleton Hall, News on March 7, 2017 by admin. Residents and staff were up for a bit of fun on Shrove Tuesday this year. A Pancake Race! And why not? Various heats were held, with a certificate and voucher for the overall prize winner. It was the taking part that was such fun. There are no obstacles in our Pancake Race and as usual we do things the Middleton Hall way. This is proof that a competitive spirit never leaves you! We were in Carnival spirits for a Venetian inspired coffee morning. Creativity knew no bounds as, before the date, residents in each corner of Middleton Hall decorated masks with true flair. The results were worn and displayed to great effect. Middleton Grove, Middleton Gardens, Middleton Court and Family Living also designed and decorated a very special full face mask of their own for a competition. As ever, the idea of a competition raised the bar even further. The winning entry, by Family Living, was stunning. Thank you to the kitchen team, who graced the tables with an array of traditional British and Italian cakes and biscuits. All in all, it was a spectacle to brighten a February morning.